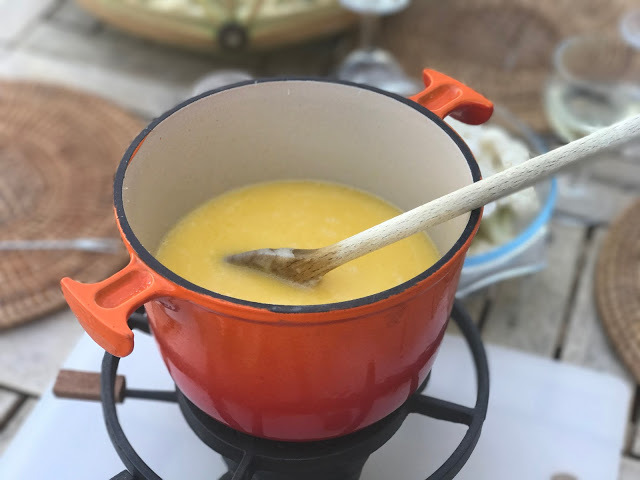 Fondue at the height of summer? It sounds all kinds of wrong doesn’t it? But actually this works very well. It’s not just a dish for snowy, shivery winters. 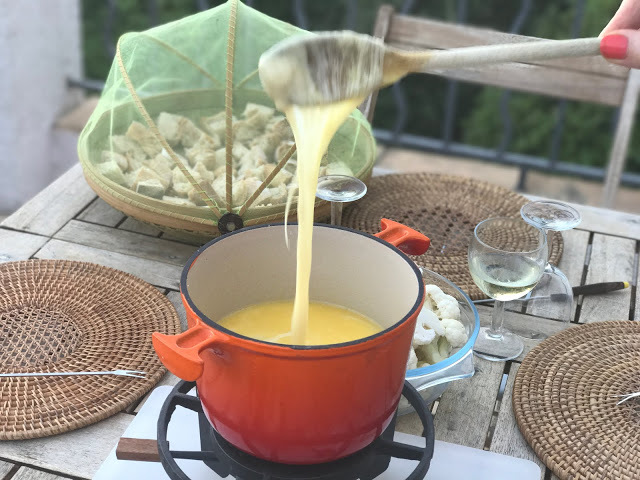 The twist on this cheese fondue is that it’s made entirely from Comté cheese, with the addition of Vin Jaune de Jura, a local sherry-like wine from Franche-Comté. It’s also the easiest and simplest fondue that I’ve ever made. 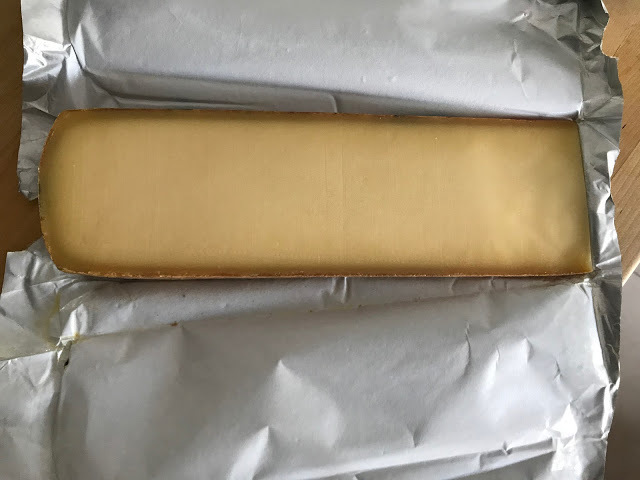 Comté cheese is so dense that it doesn’t split once heated, a problem I’ve had with more complicated recipes. 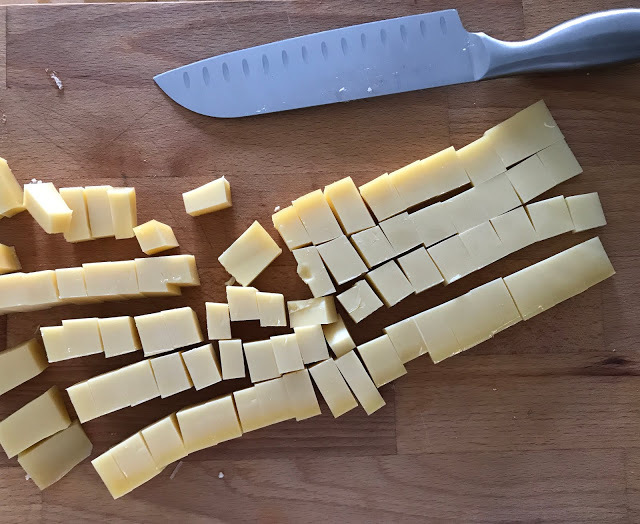 I got this recipe from a quaint mountain lodge and restaurant next to the Swiss border, La Petite Echelle (named after the ladders the Swiss neighbours used to climb the Jura range). To make it really authentically Arpitan (the local dialect), add some Sweet Woodruff herb to the fondue. Green salad with dijon mustard dressing. Optional:Small waxy potatoes, baked or boiled in their skins. Rub the fondue pan with the garlic clove. Turn on the fondue pan heater or start off the fondue on a low heat on your stove. When the cheese starts to melt, add the Vin Jaune. Continue to heat until it all melts. Add the Sweet Woodruff if you have it. Start eating by putting a cube of bread onto the end of your long fork. Dip it into the fondue. 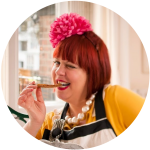 Instead of bread use large ivory cauliflower florets, broccoli florets, carrot sticks, slices of courgette. Sounds delicious, I haven't had fondue in ages. I can't wait to try it.